Looking for a Used GT-R in your area? CarGurus has 296 nationwide GT-R listings starting at $48,500. "An ultimate supercar for anyone, anywhere, at any time." Is this Godzilla's new slogan? It could be, but it's unlikely that Nissan will formally accept a link between that other Japanese export and the one due to reach our shores in June 2008. At the recent Tokyo Auto Show, Nissan formally unveiled the 2008 Nissan GT-R - the car previously known to Australian automotive writers as "Godzilla," as Australia was the only country outside Japan where the Skyline was sold. The Skyline GT-R (gran turismo racer) has a long history in Japan dating from the 1960s, when it first surfaced as a Prince Motors vehicle. From the beginning it was built to race, and race it did, becoming Japan's hot car on the domestic race circuit; one reviewer dubbed it "Japan's Corvette." When Prince merged with Nissan in 1966, the first Nissan Skyline GT-R rolled out on Japanese soil in 1969, and a second version appeared in 1973. The oil crisis killed off the GT-R '70s-era, but it reappeared in the late-'80s as the R32. The 1989 Nissan Skyline GT-R was powered by a 2.6-liter straight six, spinning twin ceramic turbochargers for 280 hp and rolling on a computer-controlled all-wheel-drive, four-wheel-steering suspension. While this might sound gimmicky, the reviewers at Car and Driver didn't think so after their March 1991 testing of a gray-market 350-hp R32. Seems its 0-60 in 4.2 seconds and quarter-mile in 12.9 seconds at 105 mph would have smoked contemporaries like the Acura NSX, Corvette ZR-1, and Ferrari 348t. Gearheads took notice. And it didn't just move in a straight line. Later on, the Skyline set the lap record for production cars at the famed Nurburgring Nordschliefe when it turned in an 8-minute-flat lap - the previous record had been held by a Porsche 944 at 8:45. The continued reverence of the tuner market for this car can clearly be seen in its starring role in the wildly popular "2 Fast 2 Furious" (that 2003 film was a sequel to the equally popular "The Fast and the Furious" of 2001), not to mention its prominence in Sony PlayStation's Gran Turismo video game. In developing the new "Godzilla," Nissan engineers adhered to a goal that, translated into English, sounds a bit stilted: "for anyone, anywhere, at any time." The new GT-R was engineered to be a supercar for the "ordinary" driver under ordinary everyday driving conditions: traffic-jammed rush hours, snow and rain storms, and long, well-paved highways. Its automotive engineering target was the 977 Porsche 911 Turbo, which in its own way is a supercar that can be driven under all conditions, but whether the "ordinary" driver can handle its spectacular performance is questionable. The GT-R doesn't look like other supercars, and that was intentional. Shiro Nakamura, Nissan's chief creative officer, has been quoted as saying that the "GT-R is not following the design vocabulary of western sports cars." Overall, the car tends to be more "boxy." But besides making a design statement and incorporating some retro Skyline features, the GT-R body underwent extensive wind tunnel testing. The results are impressive: With a 0.27 coefficient of drag, which few if any production cars achieve, the design generates fore and aft downforce as it moves through the air. The GT-R is not a small sports car. 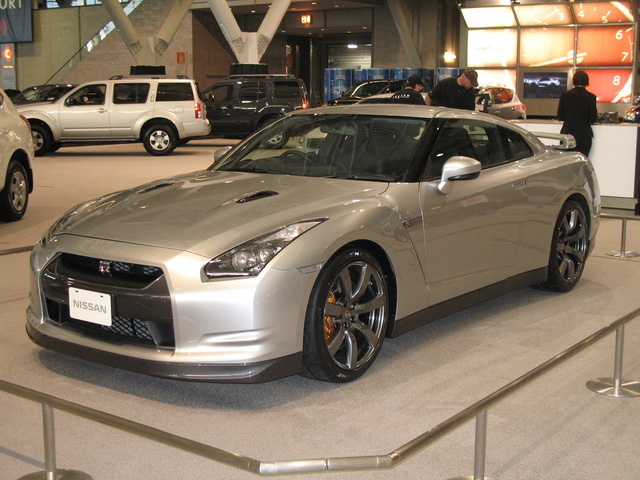 Although many weight-saving techniques were employed - like aluminum in the doors, fenders, deck lid, suspension, front shock towers, and front subframe, and carbon fiber in the front bolt-on crash structure and the six driveshafts - the GT-R weighs 3,800 pounds, rides on a 109.4-inch wheelbase (16.9 inches longer than the 911 Turbo's), and is 6.8 inches longer, 1.7 inches wider, and 2.8 taller than the Porsche. The BMW 650i, M6, and Jaguar XKR are only a little bigger. The rear seats in the GT-R are only for small people who enjoy getting pushed deep into the upholstery when the "adult" up front decides "anywhere, anytime" has arrived. The GT-R body sits on a new chassis design. Deemed the Premium Midship (PM) platform, it will be the future of Nissan and Infiniti designs. Almost all of the engine mass rests aft of the front-axle center line (two cylinders forward of the front axle and four aft of it), which is similar to the Nissan Z and Infiniti G35 Front Midship chassis. But the heart of the PM chassis is the Nissan-developed independent-transaxle-based all-wheel-drive system. Although this system requires two driveshafts, it more than compensates with its weight distribution (53:47 front/rear at rest and 50:50 under acceleration) and more precise engine-to-rear-differential geometry. The GT-R transaxle is a gem. This new six-speed dual-clutch automated manual transaxle with triple cone synchros features a twin-clutch, six-speed transmission that engages from a console shift or steering-wheel-mounted paddles. Nissan claims that in "R" mode, it can produce Formula 1 shift speeds of 0.2 second. Although the GT-R's AWD system has been called an updated version of the ATTESA E-TS system of previous GT-Rs, the new one is similar to the Haldex 4 system used by Saab and VW/Audi, which relies upon electronic sensors and hydraulically actuated clutches. Nissan's version incorporates a yaw-rate sensor that instantly transfers torque from side to side as well as front to back, depending on driving conditions. Of course, stability- and traction-control systems are standard. Torque split under 25 mph is 50/50; above that, under normal driving, it's 40/60, but under full acceleration it can reach 2/98. At the Tokyo Auto Show, Nissan was showing videos of the GT-R in snow - "anywhere, at anytime." Try that in a Viper! The suspension system incorporates Bilstein Damptronic shocks, which, along with the transaxle shift points and vehicle dynamic control, are controlled through a three-position rocker switch in the cockpit: Comfort, Sports (default), and Race. The difference between the first two settings is subtle, but not so for "R" - no body rolls and no-prisoners-taken-style shifting! The braking is by Brembo, with 15-inch vented, cross-drilled rotors all around and six-piston calipers in the front and four-piston calipers in the rear. The GT-R rides on 20-inch wheels. While there is a six-cylinder engine at the heart of all this, it is neither straight nor simply the basic Nissan/Infiniti VQ series V6. According to Nissan the VR38 is a new engine. The twin IHI turbo air-to-air intercooled 3.8-liter DOHC 24-valve aluminum V6 is equipped with variable valve timing on both cams and features plasma-applied coating on its cylinder walls. Further innovation involves the placement of the turbochargers within the exhaust manifold to reduce weight and heat loss. The result is impressive: 480 hp at 6,400 rpm and 434 pound-feet of torque from 3,200-5,200 rpm (some reviews give 473 hp and 443 pound-feet), right in the mid-range. Power is smooth, without turbo lag, and immediate. 0-60 rips by in 3.5 seconds (in 110-degree weather! ), and the GT-R gets through the quarter mile in 11.7 seconds at 149.1 mph, stopping from 60 mph in only 111.5 feet. Top speed is in the low- to mid-190s, though it will be governed to 186 mph. Two lucky reviewers actually got to drive a GT-R on the German Autobahn. One wrote that 155-mph cruising "barely requires raised voices" and the other reached "only" 176 mph due to traffic. The car is easy to drive and rock steady at those speeds. Nissan gives lateral Gs at 0.99, and one reviewer claims to have run up against that in many a corner during his Nurburgring test drive. Nissan is also claiming sub-7-minute-50-second laps of the famed Nurburgring Nordschliefe road course, which would best cars such as the Porsche 911 Turbo, Ford GT, and Ferrari 430F1. How much is all this performance going to cost? Motor Trend reports that in Japan, the entry-level GT-R starts at $57,000, while the lighter-weight 530-hp Evo-spec model is $94,000. 530-hp? That's what the rumor mill is saying, that somewhere in Nissan engineering lurks a "high-performance" GT-R model! Excuse me while I get back up on my chair after falling off in fits of giddy laughter as I typed that last sentence. Prices in the U.S. are expected to start at around $70-85,000 - nicely priced to take best performance-for-the-buck title from the Corvette Z06. Nissan has succeeded in creating the "Godzilla" for anyone, anywhere, at any time. Even the little old lady from Pasadena would be right at home in it, blowing the doors off practically everything! What's your take on the 2009 Nissan GT-R? 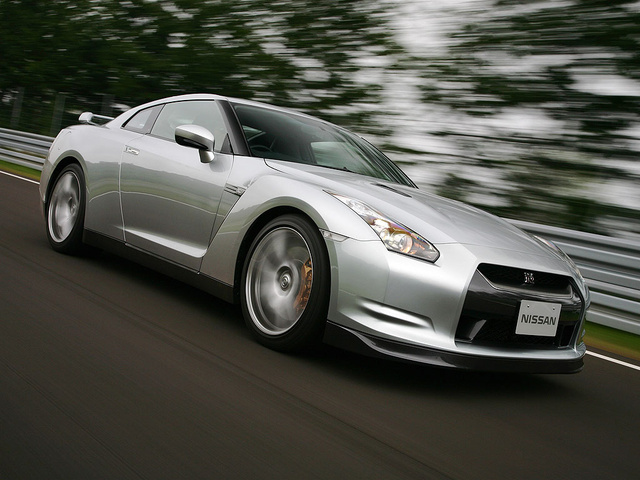 Have you driven a 2009 Nissan GT-R? Which Skyline Am I Driving? Why Is A Skyline Da Most Wanted Car?